On sale 'til March 20 for 99 cents. 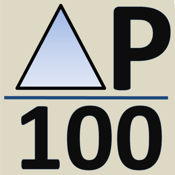 dP100 is a pressure drop calculator that calculates the pressure drop for liquids assuming 100 ft. of the line size you entered. (See future version notes below that will be released within a month). Also included are some notes providing you with examples of the roughness factor of the pipe, some details on the friction factor equation used, and a pipe table showing you various inner diameters for different pipe sizes, and their corresponding pipe designations (e.g., standard wall, sch. 40, sch. 80). The inner diameters are reported for each from small bore pipe up to 24". Guidance is given on what to use for larger than 24" if needed. Future versions (these improvements have already been coded and developed and will be released asap): vapor calculations (input SCFH or actual CFH); annular flow dP/100 (for both liquid and vapor); equivlanet diameter calculation. Also, for vapor input, you can input just the T , P, and MW and it will calculate density for you, and try and estimate the viscosity (rough correlation on viscosity though). Once the future revision is published, I may increase the price, but it's still only 99 cents for the first revision (future updates will be free of course).